In case you missed it, here’s video of the full ceremony to retire Yao’s Houston Rockets jersey (#11) from February 3rd, 2017, courtesy of ‘pennyccw’ on YouTube. It’s cool to see former teammates Steve Francis, Tracy McGrady, Dikembe Mutombo and Shane Battier. Hakeem the Dream was there, too! 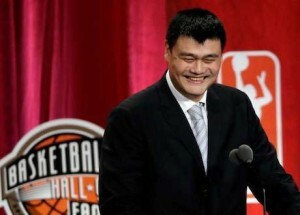 Yao has some funny stories in his speech that are classic! China Daily has an interesting piece on how well Yao’s sports commentating has been received on CCTV during the FIBA Asian Championships. Qi Xin, chief of the CCTV crew that’s broadcasting the event, credits Yao with a spike in the tournament’s ratings. “He’s made a big difference,” Qi told the Basketball Pioneer. “He’s definitely attracted eyeballs. Audiences always want to hear him. No matter what he says, it will become a headline. For more of the reviews Yao is getting for his basketball commentating, click here for the full article. It’s not much of a surprise, but it was confirmed Yao will not be playing for the Chinese National Team again, including the 2012 Olympic Games in London. 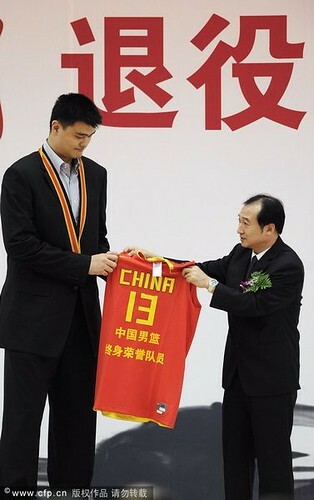 Bummer for Chinese hoops fans. 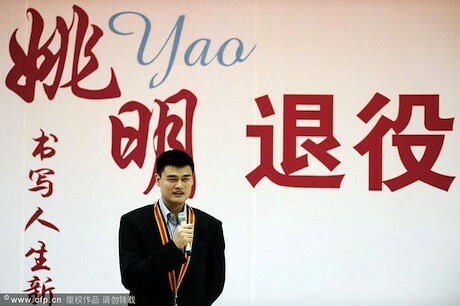 On a lighter note, Yao received many awards from various Chinese sports groups a couple of days ago at a ceremony in Beijing attended by about 200 people. Click here for more photos from the event and Raymond’s report in the forum.